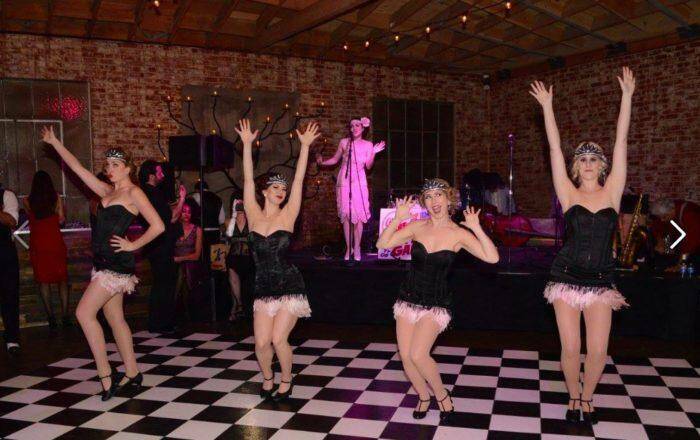 A Roaring Twenties Street Jam event in LA. Much has been said amongst band leaders about playing for dancers, and swing dancing itself has been the entry point for quite a few band leaders. Sure, sometimes dancers forget to order food and their love for tap water is legendary but playing for dancers is another way to be appreciated and employed. And as a dancer and bandleader I know how to read a roomful of dancers and I can figure out exactly what tempo will fill up a floor. My band recently played a festival called “The Roaring Twenties Street Jam.” The organizer Danielle Deborah has a clear vision for the future of this weekend event. This is a festival geared to dancers, giving them many different options for classes during the day with live bands sprinkled throughout the weekend at night. Her vision for the festival is to celebrate the entire culture of the roaring twenties minus influenza. I asked her why the twenties? For her it is about the freedom of the era. And an unexpected point she made was that it was the first time women could dance alone without a partner.They could finally flail solo, dancing the Charleston. No partner needed. The vote and the black bottom were things to be celebrated! There has been a rebirth of interest in ’20s music. As with many things our pop culture has reopened the door, with film and TV leading the way. A great example is Boardwalk Empire with Vince Giordano’s Nighthawks helping to give the period drama soundtrack its street cred. I recently had a “Facebook conversation” with a true patron of early swing music. Pre-1935 would be his musical sweet spot. I told him my first love was big band and the female vocalists of that era. Clooney and Lee were my first audio crushes, this was well before I knew of the Boswell Sisters, I was a kid. I confessed to this gentleman that one of my artistic goals was to sing with a big band. (To be completely enveloped in a full on musical hug that only a wall of brass and reeds can deliver—Lord, just typing it brings on the vapors. Side woman anyone? I’ve got the gown if you got the brass.) He warned me that big band music was the gateway drug to Bebop. I assured him that was not the case. I wanted nothing to do with modern jazz or progressive jazz. I can appreciate bits and pieces, but it doesn’t swing to me it’s not my musical thing. But the big band sound at its peak gives me the chills. The younger generations of fans come at swing music from so many non-musical places. They want to wear a mini skirt with a flapper head piece. They romance the WW2 period. (That’s because they didn’t have to use ration coupons or worry about Polio.) They love learning a dance where they get to touch another person. Novelty may bring them in the door, but some of them are hooked and love the music and the musicians. They add new life to an art form that fights to stay relevant, I say: Welcome! Enjoy! **Roaring Twenties Street Jam will be holding a weekend workshop with classes and live music September 24-25 Pasadena, CA. Visit them online at RoaringTwentiesStreetJam.com.